Same interface - updated info! TIWIKE updated to GU 45 - enjoy! This updates only the text files in the infocenter/miscellany/tiwike folder (If you use Drum's version, it goes in DrumUI/infocenter/miscellany/tiwike) - I've done nothing to the InfoCenter itself. 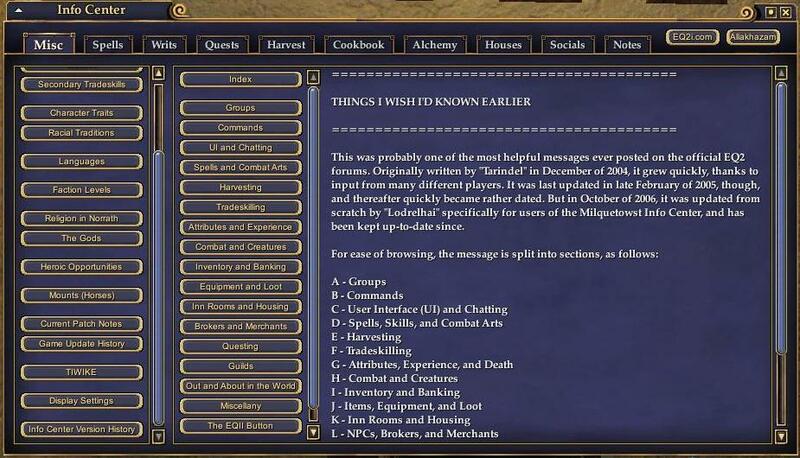 It's my pleasure to update this, both here and on the EQ2 boards - this thread was way too useful to let die! As for taking over other updates, I've been eyeing a couple of the text sections and the start button, which has been whacked for me since LoN came out. I'm reluctant to take over a UI as a whole that isn't abandoned - and Daryl does still post from time to time. Let's see what Kunark makes or breaks in terms of info and UIs (tradeskill change previews have me in a tizzy as it is!). Thanks for posting this and for maintaining that post.